Hospital CEO pay: red herring or key in state funding debate? 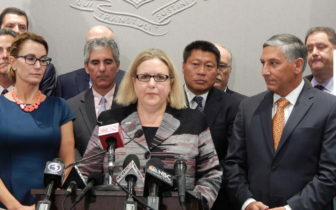 Connecticut Hospital Association CEO Jennifer Jackson, center, during a press conference with House Minority Leader Themis Klarides and Senate Minority Leader Len Fasano. As hospital leaders warn of potential job and service reductions in response to state funding cuts, the six- and seven-figure pay packages of Connecticut hospital executives have emerged as a point of contention. To some, the focus on CEO pay is a red herring meant to distract from years of underfunding Medicaid while increasing taxes on hospitals. Others see it as a way to point out misplaced priorities at nonprofit hospitals that rely heavily on government money, at a time when executive pay and income disparities have become a rallying cry in national politics. “You can cut the executive compensation of just three executives” to make up for projected deficits being blamed for planned job cuts and service reductions at Windham Hospital, state Rep. Gregg Haddad, D-Mansfield, said this summer as hospital workers and lawmakers protested the cuts. Hospital officials say competitive compensation is needed to attract and retain qualified leaders – the same logic used to justify the salaries of top-paid state employees. Some have questioned why their pay is singled out when the state has provided tax breaks to corporations that pay executives millions more. 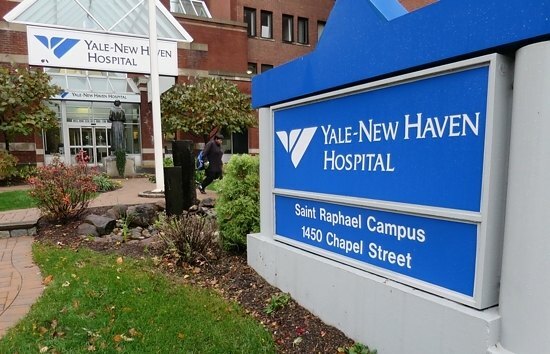 The Yale New Haven Health System topped the state in hospital CEO pay last fiscal year. And they say the focus on executive pay distracts from the budget hits their organizations have faced in recent years. After the cuts Malloy issued last week, hospitals’ tax burden this fiscal year is expected to be almost $500 million higher than it was in 2011. “The [hospital] CEOs in the state could all work for free and it wouldn’t make an impact on the cuts we’re talking about,” said Vin Petrini, a spokesman for the Yale New Haven Health System. It’s legitimate to discuss what pay is appropriate for hospital executives, said Stephen Frayne, senior vice president for health policy at the Connecticut Hospital Association. But he questioned its role in the context of funding cuts. “It seems like every time the state wants to justify withdrawing now hundreds and hundreds and hundreds and hundreds and hundreds of millions of dollars from taking care of those who have the misfortune of being ill enough to have to go to a hospital, the justification is, ‘Well, you pay hospital CEOs too much, and therefore that covers all the sins,’” he said. Gian-Carl Casa, undersecretary for legislative affairs in Malloy’s budget office, said the administration looks at more than executive pay and believes hospitals’ cost structures overall are too high. That has a direct impact on taxpayers, he added, since the state pays for the care of more than 700,000 Medicaid clients as well as more than 200,000 state employees, retirees and their families. Casa said that while hospital officials have blamed the state budget for layoffs and service cuts, Connecticut hospitals made $664.9 million more than they spent last fiscal year. Hospital corporate systems, which include parent companies and subsidiaries, took in $916.4 million more than they spent last fiscal year. “With a billion dollars in profit in our hospital systems and executive compensation in the tens of millions of dollars annually, perhaps the focus should be on driving down the cost of care for all of us? Or being efficient with the services offered?” Puglia said. The Yale New Haven system, which includes Bridgeport, Greenwich and Yale-New Haven hospitals, topped the state in CEO pay during the 2014 fiscal year, the last year for which figures are available. CEO Marna Borgstrom received $3.5 million in salary and fringe benefits, according to filings with the state Office of Health Care Access. The lowest-paid CEO was Kimberly Lumia of Sharon Hospital (the state’s only for-profit hospital), whose salary and fringe benefits amounted to $277,021. Salary and salary plus fringe benefits for Connecticut hospital CEOs, based on hospital filings with state regulators. Chief executives for Hartford, Backus and Windham hospitals, MidState Medical Center, and their parent company, Hartford HealthCare, were not included in the filings and are shown in a separate table. For information on Johnson Memorial Hospital, see note below. Connecticut’s 29 acute-care hospitals report the top 10 highest-earning positions to the state. In all, those 290 employees received $142.7 million in salaries and fringe benefits in 2014, averaging $4.9 million per hospital. Just over half of those listed were administrators. Based on the state filings, the average hospital CEO salary was about $850,000; adding fringe benefits raised it to $1.1 million. But the actual average is likely somewhat higher because the filings don’t include the leaders of four hospitals run by Hartford HealthCare, or the organization’s CEO. 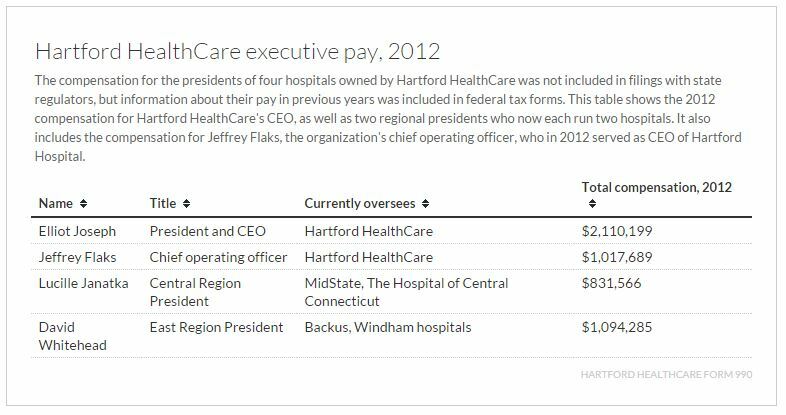 According to federal tax filings, Hartford HealthCare CEO Elliot Joseph received $2.1 million in 2012, while the then-CEO of Hartford Hospital was paid just over $1 million. How does that compare nationally? According to an analysis last year by the publication Modern Healthcare, the average cash compensation in 2012 was $2.2 million for chief executives at nonprofit hospitals. Pay ranged widely, the analysis found, from $178,810 to $10.7 million. What’s the basis for CEO pay? They found that leaders of larger hospitals and teaching hospitals were paid more, while those whose hospitals had more poor or Medicare patients were paid less. Higher levels of patient satisfaction and higher levels of advanced technology were both linked with higher executive pay. Factors that had no significant relationship to CEO compensation, according to the analysis: hospital financial performance, charity care, community benefit, or quality measures including patient mortality or readmission rates. Union officials have pointed to a 2010 study by two UConn School of Business professors who analyzed CEO pay at 29 nonprofit Connecticut hospitals between 1998 and 2006. They found that higher CEO pay was associated with a higher occupancy rate of staffed beds, while having more patients covered by Medicare and Medicaid – which tend to pay less than private insurance – was associated with lower pay. The authors, Rexford Santerre and Jeffrey Kramer, suggested that if nonprofit hospital CEOs are motivated by pay, they would face incentives to increase hospital size and admit more privately insured patients, but not to provide charity care or serve patients with Medicare or Medicaid. Santerre, who said he thinks state funding for hospital care should be based on the cost of treating Medicaid patients rather than hospital CEO pay, suggested a different focus. “I think the debate should focus on whether nonprofit hospitals provide enough community benefits to justify their tax exemption,” he said. Are hospitals different from other businesses? Hospital officials note that the Malloy administration has not made CEO pay an issue with other industries, including those that have received tax breaks from the state. “If the governor really cared so much about CEO compensation, he wouldn’t have given $52 million to a hedge fund in a taxpayer funded billionaire bailout,” Senate Minority Leader Len Fasano, R-North Haven, and House Minority Leader Themis Klarides, R-Derby, said, referring to the hedge fund Bridgewater Associates, which was offered up to $52 million in state subsidies as it expands its Westport headquarters. Are hospitals substantively different from other companies? Yes, said Benjamin Barnes, Malloy’s budget director, when asked in June. At the time, the administration was pushing for changes to recently passed tax increases that drew criticism from corporations including Aetna and Travelers. A key difference, Barnes said, is that hospitals rely on both direct government payments from Medicaid and Medicare, and payments from private insurance plans that are largely paid for with untaxed income. “So the notion that they are independent businesses and should be treated the same way we treat widget manufacturers is hugely misguided in my view,” Barnes said. Petrini, the Yale New Haven spokesman, countered that there are other well-respected private employers in Connecticut that also do significant business with government, including United Technologies and Electric Boat – but state officials haven’t taken issue with what their leaders are paid.